:The question of what makes a life worth living is more vital now than ever. In today's pluralistic, post-secular world, universal values are dismissed as mere matters of private opinion, and the question of what constitutes a flourishing life--for ourselves, our neighbors, and the planet as a whole--is neglected in our universities, our churches, and our culture at large. Although we increasingly have the technology to do almost anything, we have little sense of what is truly worth accomplishing. 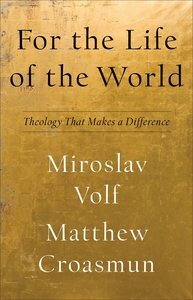 About "For the Life of the World: Theology That Makes a Difference"
Miroslav Volf (Dr. Theol., University of Tubingen) is the Director of the Yale Center for Faith and Culture and the Henry B. Wright Professor of Systematic Theology. Professor Volf's recent books include Free of Charge: Giving and Forgiving in a Culture Stripped of Grace (2006), Archbishop of Canterbury Lenten book for 2006; Exclusion and Embrace: A Theological Exploration of Identity, Otherness, and Reconciliation (1996), a winner of the 2002 Grawemeyer Award; After Our Likeness: The Church as the Image of the Trinity (1998), winner of the Christianity Today book award, and The End Of Memory: Remembering Rightly in a Violent World. A member of the Episcopal Church in the U.S.A. and the Evangelical Church in Croatia, Professor Volf was involved in international ecumenical dialogues (for instance, with the Vatican Council for Promotion of Christian Unity) and interfaith dialogues (most recently in Christian-Muslim dialogue). A native of Croatia, he regularly teaches and lectures in Central and Eastern Europe. Matthew Croasmun (PhD, Yale University) is associate research scholar and director of the Life Worth Living Program at the Yale Center for Faith and Culture. He is also staff pastor at the Elm City Vineyard Church.